François-Étienne Blanchet I (c.1700 - 1761) was the second son of Nicholas Blanchet I and followed him in his craft. He was one of the finest harpsichord builders of the Baroque era and lived his life in Paris, as did all his descendants. They continued his craftmanship until the mid-19th century, by which time they had become piano makers. Blanchet made important improvements in harpsichord construction, producing an instrument with much lighter tone quality, strong in projection and rich in overtones. The sound of a typical 18th-century French harpsichord is delicate and sweet compared to the more astringent sound of a Ruckers. The prominent composer François Couperin owned a large harpsichord by Blanchet. Instruments made by the Blanchet family were of a high quality, much in demand and sold for high prices. Blanchet's lust for creative experiments was not only shown in the construction and sound character but also in the decoration of the instruments. Jean Berain Huet, a famous decorator of the time, had the outside of the lids painted with monkeys making music or love, instead of the more common Chinese figures. This daring approach probably both challenged and delighted the French royalties at the time. 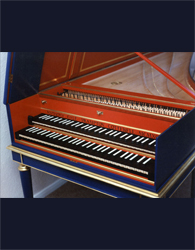 The instrument add-on for use with Pianoteq is a physically modelled virtual copy of harpsichord François Etienne Blanchet, "Château de Thoiry" (1733), copied by Anthony Gale (Frampton Cotterell, UK, 1993).